Tag Archive | "Bear Lake"
White Perch Record: This 2-pound white perch was caught by Cindy Lou Cordo, of North Muskegon, on Bear Lake (Muskegon County) this spring. The Michigan Department of Natural Resources recently confirmed two new state-record fish for black buffalo and white perch. This marks the second and third state-record fish caught in 2015. 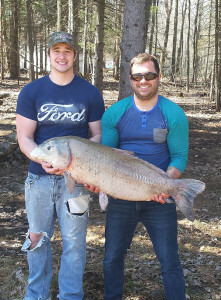 The state record for black buffalo was broken by a fish caught by Sage Colegrove of Muskegon on the Grand River in Ottawa County Sunday, April 12, at 1 a.m. Colegrove was bowfishing. The fish weighed 44.54 pounds and measured 38.50 inches. The record was verified by Rich O’Neal, a DNR fisheries biologist in Muskegon. Black Buffalo Record: Sage Colegrove (right) holds on to his new state-record black buffalo, with help from friend Richard Laing (left). 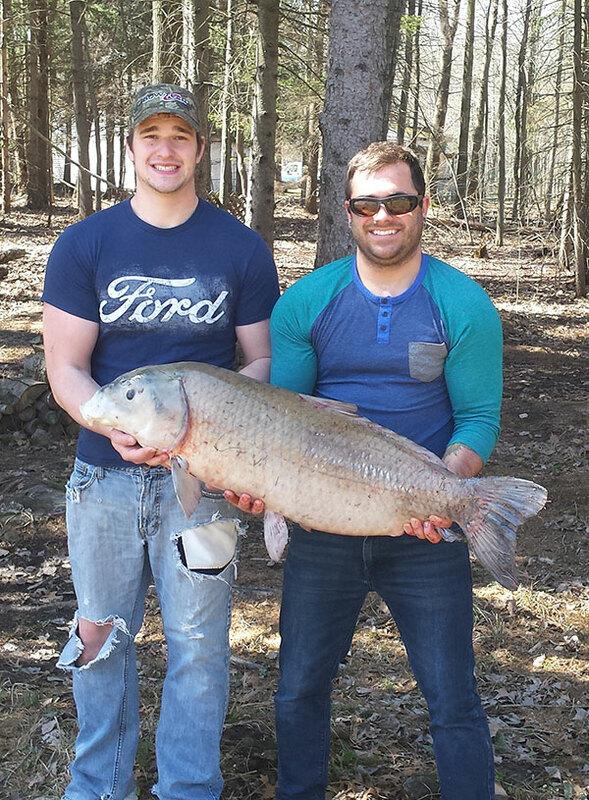 The 44.54-pounder was caught on the Grand River in Ottawa County. The previous state-record black buffalo was caught by Joshua Teunis on Bear Lake (Muskegon County) June 15, 2014. That fish weighed 41.25 pounds and measured 38.25 inches. The state record for white perch was broken by a fish caught by Cindy Lou Cordo of North Muskegon on Bear Lake in Muskegon County Saturday, April 18, at 4:30 p.m. Cordo was baitcasting with a spinner. 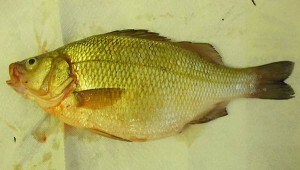 The fish weighed 2.0 pounds and measured 13.57 inches. The record again was verified by Rich O’Neal. The previous state-record white perch was caught by Aaron Slagh on Muskegon Lake (Muskegon County) Jan. 21, 2014. That fish weighed 1.93 pounds and measured 13.25 inches. For more information on fishing in Michigan – including a roster of state-record catches, visit Michigan.gov/fishing.